A court in Egypt has upheld the three-month prison sentence given to leading comic actor Adel Imam for insulting Islam in his films and plays. Imam was also fined $170 (£105) by the court in the capital, Cairo. The 71-year-old was initially found guilty in absentia in February in a case brought by an Islamist lawyer, but was given a retrial. He may appeal. Imam's is the latest case concerning freedom of expression against a high-profile figure in Egypt. Two separate lawsuits accusing the Coptic Christian Telecoms tycoon Naguib Sawiris of blasphemy were dismissed earlier this year. Mr Sawiris angered conservative Muslims last year when he tweeted cartoons of Mickey Mouse in a beard and Minnie Mouse wearing a veil. The case brought against Imam by Asran Mansour, a lawyer with ties to Islamist groups, accused the actor of frequently mocking the authorities and politicians in his films and plays, and offending Islam and its symbols. Imam's movies regularly top the Egyptian box office and the types of roles he plays have varied enormously across his career. Mr Mansour was reportedly offended by the film Al-Irhabi (The Terrorist), in which Imam plays a radical Islamist; the play Al-Zaeem (The Leader), a comedy satirising Middle Eastern autocrats; and the film Morgan Ahmed Morgan, which sees a rich businessman stand for parliament. On Wednesday morning, Imam's lawyer confirmed he would appeal against the verdict, which he said was "given on the wrong legal basis". "My client's films were certified, not censored, by surveillance authorities before their release to the public," Sawat Hussein told the Reuters news agency. Fellow Egyptian film star Hend Sabri meanwhile told the BBC World Service's World Update programme that Imam's conviction was a "sad day" for "not only film-makers, but all artists and all liberals". "It's legal nonsense and it's ethical nonsense. We are all very upset. We are all going to react - we cannot stay silent after such a ruling," she said. "After the revolution that we thought would bring the best to Egypt and to the Arab World, the Arab Spring cannot be transformed into a nightmare. We cannot let it disappear without a fight." Ms Sabri - who starred alongside Imam in the film The Yacoubian Building - said there would be a major protest. 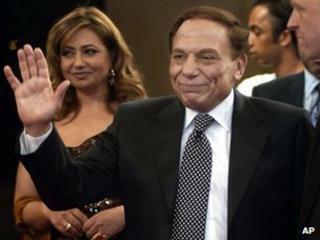 "Adel Imam is not only an actor, Adel Imam is a symbol. Whether we like his films or not, whether we agree with him or not, that's not the question now." She added that people were beginning to censor their own work. "We are all scared. We are all scared about our freedom of speech and about the freedom of expressing ourselves and our ideas, and the freedom of our art."